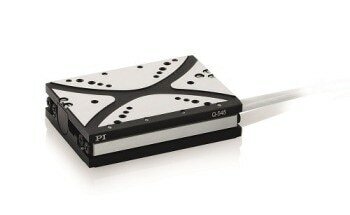 PI’s palm-sized motorized positioning stage combines precision with long lifetime components, making it more attractive to research and industry. 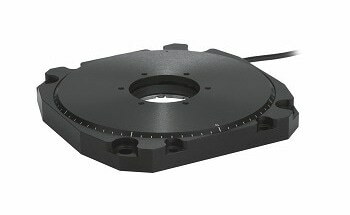 PI (Physik Instrumente), a top provider of precision motion control and positioning solutions for more than 4 decades, has released a low-profile motorized positioning stage – the M-122 – with a very small footprint of 60x86mm and a travel range of 25mm, best suiting it for research and industrial applications including fiber alignment, metrology, quality assurance testing, photonics packaging, test equipment, and micromachining. The compact closed-loop positioning stage can handle payloads to 11 lbs, with velocity to 20mm/sec. 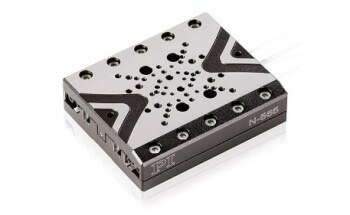 The optical linear encoder provides 100 nanometers resolution and better linearity and repeatability compared to rotary encoder or stepper motor equipped positioners. Long service life and excellent guiding accuracy with minimal backlash are guaranteed by the preloaded ball-screw drive and precision crossed roller bearings with anti-creep cage assist. 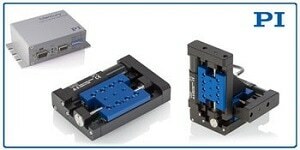 M-122 stages can be combined to create very compact XY and XYZ systems. Combined with the networkable low-cost C-863 Mercury servo motor controller, M-122 stages offer high performance at a competitive price. PI is a leading manufacturer of precision motion control equipment, piezo motors, air bearing stages and hexapod parallel-kinematics for semiconductor applications, photonics, bio-nano-technology and medical engineering. PI has been developing and manufacturing standard & custom precision products with piezoceramic and electromagnetic drives for 4 decades. The company has been ISO 9001 certified since 1994 and provides innovative, high-quality solutions for OEM and research. PI is present worldwide with twelve subsidiaries, R&D / engineering on 3 continents and total staff of 850+.